As a long-term, intensive, year-round youth development program, FSS staff and volunteers comprehensively engage and support our students through a combination of academic enrichment, squash, health & wellness, community service and leadership development, cultural exposure, summer opportunities, and support for low-income families in Wilmington. (in grades fifth, sixth and seventh) until the day they receive their degree from college. 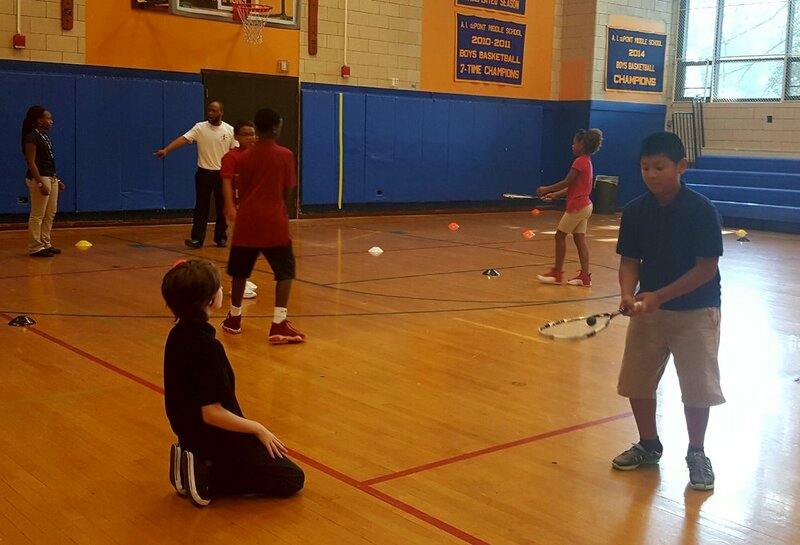 During the summer months, First State Squash offers programming to broaden horizons for our students. For some, this translates into more squash, either through participation in summer squash camps throughout the country, at places such as Dartmouth College, Princeton University, and Williams College. For others, it means traveling abroad with partner organizations like Summer Search or enrolling in academic programs like Balfour Academy at Northeastern, Phillips Exeter Academy’s Summer School, and Crimson Summer Academy at Harvard. These incredible activities empower our youth by enhancing their overall drive and will to succeed, challenging their minds and bodies, and helping them grow as individuals. First State Squash’s long-term, year-round approach to programming allows staff members, students, families, and supporters to develop strong relationships. This close-knit, supportive community is what makes First State Squash very unique from all other after school programs. Squash is “The Hook!”, and also considered the “healthiest sport in the world” according to Forbes Magazine. First State Squash students learn, practice and train on the squash court three days a week from September until June. From their initial introduction to the sport, to the time they graduate from high school, the FSS students will have logged no fewer than 1250 on-court practice hours. All of our players develop a love for the game; some a healthy obsession. Each practice lasts for 75 - 100 minutes and focuses on racquet technique, skill development, footwork, strategy, rules and refereeing, sportsmanship and developing mental readiness for competition. First State Squash squashers are then able to showcase their learned skills by competing in matches against private school teams, other urban squash programs, and in squash tournaments at the local and national levels. Dozens of other urban squash program alum have attained state and national rankings, and many have gone on to compete on college teams such as Bates, Colby, Hamilton, Harvard, Hobart, Northeastern, Tufts and Wesleyan. Squash is a very physically demanding sport, and it is essential for all First State Squash students to understand, as athletes, the importance of injury prevention, being in shape as well as having a mind-body connection. Each First State Squash practice consists of a warm -up and stretching as well as competitive sprint runs which gets their adrenaline flowing, increases their heart rate and also tests their fitness and competitive levels. FSS students are also introduced to weight training and yoga. This overall regimen provides our students with an opportunity to learn the benefits of exercise at a young age, and gives them the proper training and knowledge to maintain healthy lifestyle habits as they continue to grow. In addition to the fitness component of the program, our students are thoroughly educated on healthy eating habits, and are required, during all program hours, to follow the FSS nutritional guidelines. NO JUNK FOOD! First State Squash provides each student with a healthy snack at every practice in order to ensure that participants are ready and fueled for the day’s activities. We also focus on the mental aspect of the game by implementing visualization and meditation techniques, and cover topics such as healthy peer relationships, sexual education, and other health related issues. Community Service is one of the core components of the First State Squash program. Through participating in service projects, students broaden their awareness of social issues, develop a sense of civic responsibility, and learn the value of giving back to their community. Projects vary from opportunities to interact with populations in need to community beautification efforts and administrative support for local organizations. First State Squash students are required to participate in at least 15 hours of community service per year. There are many summer options for our students which provide opportunities for personal growth and enrichment, increase students’ squash and academic skills. First State Squash runs a 4-week day summer camp for current participants, and for students interested in joining the program in the fall.